Balani Custom Clothiers - For over 50 years, BALANI has specialized in crafting custom suits of the highest standards from the world's most prestigious fabrics. Their highly-knowledgable team of clothiers will help you determine the proper cut, fabric, and style that is suited best to reflect your personal sense of style and body type. Tom James - Tom James Company is the world's largest manufacturer of custom clothing. They make high quality custom suits and custom dress shirts for busy professionals in Ohio and the surrounding areas. They also provide all of the furnishings needed to complete your custom look. Their highly-trained bespoke tailors at Tom James of Ohio come directly to your home or office, saving you valuable time. Custom Tailoring by Boris - A family owned and operated business that has been providing Columbus, Ohio with tailoring services including alterations, custom dress shirts, custom suits, etc. since 1983. The founder, Boris, has a degree in Textile Engineering from Europe. With over 25 years of experience, Boris has mastered the art of tailoring. The custom shirts that he creates are truly works of art, engineered to perfection. Wittmann Custom Tailoring - John started working in the tailoring trade at the age of 21. Opening the store in their current location, he has worked in the industry for over 23 years and comes from a long line of custom tailors. Made by hand to your exact measurements. Choose from the best fabrics in the world including Zegna, Loro Piana, Barberis Holland & Sherry and others. Maestro Tailor - Nothing says style more than a bespoke suit. A custom made suit is made specifically for your body. Every cut and stitched is based on a specific measurement. Unlike made to measure, where an already made suit is tailored to your body, a bespoke is specifically designed with you in mind. Working alongside Mark, together, you select the style, the number of pockets, the buttons, the lining, and most importantly, the wool that will become your one-of-a kind suit that will be the envy of your friends and coworkers. Joseph Scafidi Inc - Each garment from Joseph Scafidi Inc. is custom-made to individual measurements and painstakingly fitted until even the most rigorous sense of style is satisfied. A custom-tailored suit from Joseph Scafidi Inc. will fit precisely because the fabric is cut to your measurements and all of the sewing is done by hand. It will drape neatly because the front is hand-basted, not glued. And it will wear for years because of its expert cut and tailoring. Nobby Custom Tailors - When you buy off the rack, you risk wearing a suit that doesn't fit your particular size or body type. Invest in a custom tailored suit from Nobby Custom Tailors, Inc. so that you can show up to every event with the finest fitting suit in the crowd. Their seasoned tailors have experience working with various types of fabrics and are able to make custom designs for your specific style. Come into their shop today to get fitted for a plush suit that will last you a lifetime. C. Stefano Custom Tailoring - C Stefano is a top-notch tailor. He specializes in custom tailored men's suiting, but has a good business in women's alterations as well. Romualdo - Established in 1968 by Romualdo Pelle in the quaint community of Madeira, Ohio, Romualdo has become a Cincinnati staple for authentic menswear, bespoke garments, and old world tailoring. Garnering national recognition while staying true to their goal of delivering exceptional products with unparalleled service, Romualdo is truly a destination for any style minded individual. Bianco Custom Tailors - Bianco Custom Tailors produces garments of exquisite quality, comfort, and style which has gained Bianco Tailor a well known reputation not only in Cincinnati but around the country. Bianco Tailor offers its customers the finest fabrics in the world, such as: Loro Piana, Ermenegildo Zegna, Barberis Wool to cater to your specific needs. Davide Cotugno Executive Tailors - The magic in the hands of your tailor is to capture a style that fits your body perfectly and that works for your lifestyle. For us, it is not simply a garment; it is a work of art that transforms raw fabric, linings and buttons into something that you are truly proud to wear for many years. So much so, that people will stop and compliment you. Their tailors still hand cut and sew each garment to your individual paper pattern, which is then kept on file for future orders. The production process creates a soft, supple look with a sturdy finish that will always look good no matter how much abuse it takes. While they could take easier steps, they still believe that some things require the traditional steps that were handed down from the European grand masters. 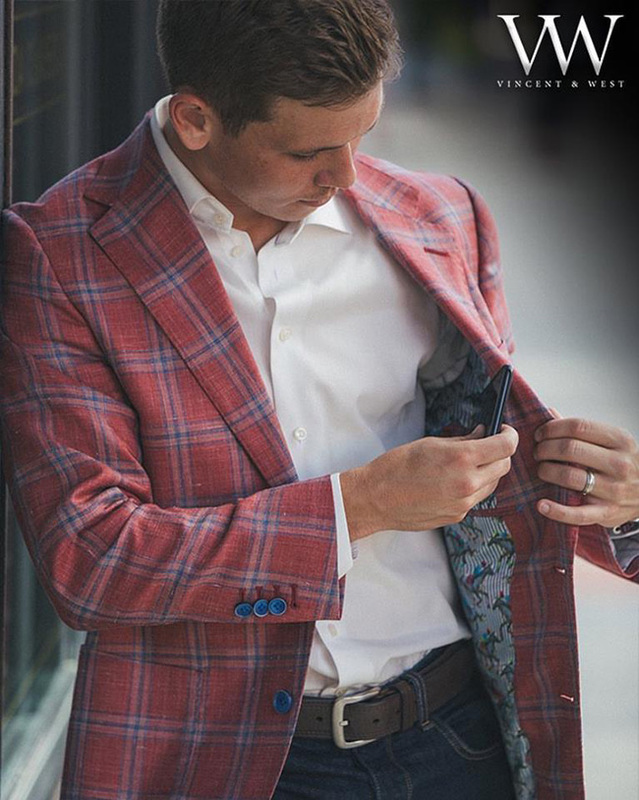 Vincent & West Custom Clothiers - Vincent & West began in 2015 with a passion to provide the finest quality with the highest rated customer service in the industry. From completely personalized suits and tuxedos to sports coats, dress shirts and golf trousers, they use the most beautiful Italian fabrics from mills including Ermenegildo Zegna, Loro Piana, Scabal, Guabello, and Vitale Barberis Canonico. All Vincent & West suits come standard with full canvas linings, working buttonholes, precision alterations and our commitment to creating your perfect suit. They offer so many features that they guarantee no two Vincent & West suits are ever created the same. From full handmade suits, to unlined or unconstructed jackets, hand finished pick stitching, custom linings, built in pocket squares along with hundreds of fabrics to choose from.